Bosnia and Herzegovina (BiH) is still one of key points of discrepancies in the Balkans. Unfortunately, BiH cannot be called a full-fledged and sustainable state due to peculiarities of its political order, permanent political and economic crisis and complicated ethnic and confessional composition. At present, life in BiH, which is formally a confederation, is organized on ethnic and religious principles. Serbs live in Republika Srpska (RS), pray to their God, vote for Serbian parties during elections, whereas Croatians and Bosnians (Bosnians are Muslims) reside in the biggest part of BiH and try to do their best in order RS ceases to exist as an independent political formation. The only thing that unites everyone in Bosnia and Herzegovina is low, comparable to poverty, living standards and full dependence on foreign countries: Russia and Serbia that support RS on the one side and U.S. and EU that seek their own economic and political interests in spite of Moscow and Belgrade. According to available information, 40% of total population of BiH is unemployed. Most of the unemployed are young people. Considering that ideas of radical Islam, Wahhabism, and other extremist trends have gained ground in Bosnia and Herzegovina (over 700 citizens of BiH officially fought on the side of the Islamic State and Jabhat al-Nusra (terrorist organizations banned in Russia – EADaily’s note), and BiH ranks the first in the world by the number of its citizen fighting for IS in ratio to its total population) and most of the unemployed (60%) are young people, it appears that the situation in BiH is important not only for Southeastern Europe but also for the entire EU. It is worth mentioning that Brussels that finally accepted BiH’s request for accession to EU in September 2016, still avoids mentioning any potential date of the country’s accession to the union. As a EU member, BiH may bring much more problems to EU than it does now. After all, now they can surround it with a barbed wire fence, when necessary, and manage with previously developed economic controls. 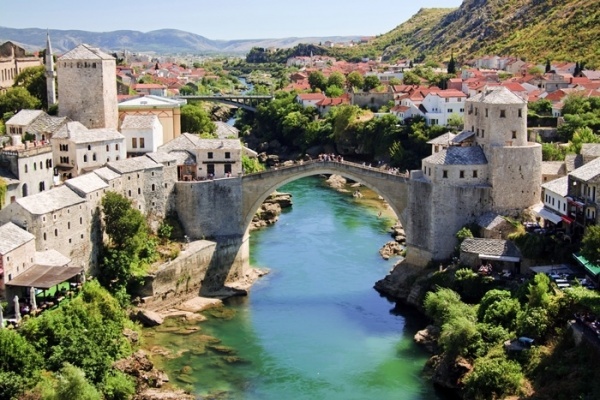 Protected by the world community for over 20 years, Bosnia and Herzegovina has too many political and economic problems and lacks single government and management system. Coupled with ethnic and confessional situation, all this makes Western countries control it remotely. And this stance of the EU, U.S. and other big powers has brought no significant benefit to BiH. One of the major blows on the weakened economy of BiH was a privatization program supported by Western financial and political organizations. While industrial facilities in the territory of RS were fully destroyed during the military actions of 1990, big factories in the territory of Federation of Bosnia and Herzegovina survived (near Tuzla city). In 2000-2001, those enterprises were privatized mostly by Western European and American companies. However, most of the privatized plants and factories were not modernized and new owners just maximized profits and reduced investments. Besides, by the moment when the Association Agreement was signed with the EU in 2008, cash incomes of investors were insignificant and the government received just 1 billion EUR in cash from total privatization cost – over 5 billion EUR. After signing the Association Agreement, the situation has not improved, but even worsened, as local goods proved non-competitive on the European market. This triggered mass layoffs and gradual stagnation of what remained from industrial sector of BiH. Specialists say, industry of Bosnia and Herzegovina has nearly stopped operating and enterprises fail to pay taxes. According to data of international organizations, economy of BiH started restoring in 2013: GDP grew for 0.5%-0.6%. However, one can hardly call an improvement such insignificant growth with regular declines. BiH is still one of the most depressive countries in Europe with a bulky, expensive and inefficient state system. Europeans currently avoid speaking about this openly. Moreover, the World Bank even announced a 3.2% GDP growth in BiH for 2018 and 3.4% in 2019. Nevertheless, experts admit that the major economic problem of the country is imbalance of the economic model: prevalence of the government sector of economy over the private sector, consumption over investments, and import over export, as well as high dependence on foreign financial infusions. Besides, no one in BiH, neither foreign nor local investors, care for the social situation in the country. The reason might be “merging” business and government. Most analysts say the Western capital is taking control over the country’s strategic resources. BiH is known to have coal, iron, copper, lead, mercury, bauxite, manganese and silver reserves. Mining industry is crucial for its economy. Foreign investors have actually taken control of this sector and tried to dictate their own rules to BiH government for many times. For instance, recall the recent incident with ArcelorMittal, the owner of Zenica, an integrated metallurgical combine in Bosnia (received iron ore raw materials from ore-dressing and processing plants Prijedor and Ljubija). At the request of IMF, government of Republika Srpska where Ljubija is located, announced privatization of the government’s stake in ore-dressing and processing plant, but chose Israeli Investment Group (IIG), an Israeli-Russian-Kazakh-African company that offered more favorable terms than ArcelorMittal did. The latter made claims and threatened with “legal process” unless the government stake in Ljubija is sold to it. Could this happen in a Western European country or U.S.? No, it could hardly happen there. However, no one in Brussels or Washington cares for such “trivial matters.” They urge “legal” solution to the issue in accordance with the international law. Perhaps after vain expectations of prosperity from European and U.S. investments, BiH started seeking alternative ways out of the situation, including through cooperation with Russia and China. In this light, it is worth mentioning that in 2016, the first large infrastructure project was implemented in BiH on a Chinese loan of 10 million USD within “16+1” format. This was one of the first results made under “Belt and Route” project - construction of Stanari thermal power plant. The contractor of the project was a Chinese company. In 2017, Beijing said Bosnia and Herzegovina has special resource privileges under Silk Road Economic Belt and 21st Century Maritime Silk Route initiatives and bilateral relations are based on mutual benefits and gains. The two countries actively negotiate to launch cooperation in the field of energy and transport infrastructure and discuss joint construction of economic zones and cooperation in industrial development planning. s for Russia, its place and role in BiH is not big. Moscow cooperates with Republika Srpska, which certainly holds it from engaging in the economic life of the entire confederation more actively. For instance, yet in 2007, NeftegasInCor bought out Bosanski Brod oil refinery (65% of shares) idling since 2005 for 119 million EUR, Modrica engine oil producer company (62.3% of shares) and a chain of car-filling stations of Petrol Company. In 2012, Sberbank of Russia acquired Volksbank International (VBI) that was then among Top 10 banks in BiH. In spring 2016, Republika Sprska announced it would provide Russia an opportunity to participate in privatization of its enterprises. Eventually, development of bilateral trade, despite the sanctions imposed on Russia and Moscow’s return measures, enhanced the bilateral cooperation: commodity turnover of Russia and BiH for 9 months of 2017 totaled $125,646,207, growing by 40.93% as compared to the same period of 2016. However, despite this, Russia’s influence in BiH is still not significant. The major economic and consequently political partners of Sarajevo are still EU and U.S. that control the Bosnian leadership and what has remained from its economy and resources.